Your message is important! Telling it can help others–and help you grow your business. 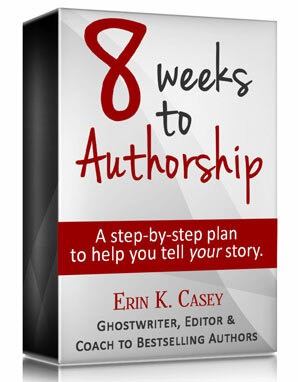 8 Weeks to Authorship is an online training program created by Erin Casey, ghostwriter, book coach and editor to bestselling authors. This proven system has helped Erin and her clients write books that consistently receive 5-star ratings and stellar endorsements, all of which boost an author’s credibility as an expert. Each day you’ll move one step closer to becoming a published author. 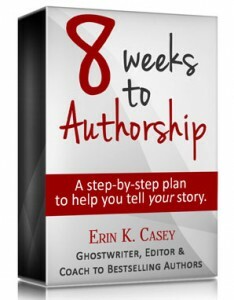 Your investment for the 8 Weeks to Authorship Program is only $77 $48. 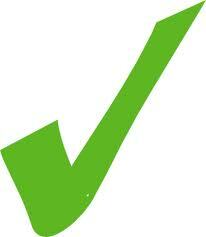 Immediately after checkout you will receive an email with instructions for downloading your first week’s action plan. This is a digital product. Here’s to your writing success!